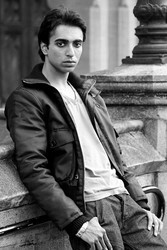 Abdul was the first model I've met on ModelMayhem.com. It was back in Sept. 2006 few month after I landed in London moving away from France. I was trying to get into a new area of photography and was trying to build up a portfolio. At that time I was still thinking that the best light was the natural light as flash photography always gave me bad results. So natural light was the way to go. This first model photoshoot with Abdul did open a door to the TFP / TFCD (Time For Print / Time For CD) modelling world of photography.